Location: Ally, in the Cantal departement of France (Auvergne Region). Ownership / Access: Owned by the Fayet de la Tour Family and its open to the public and guest. 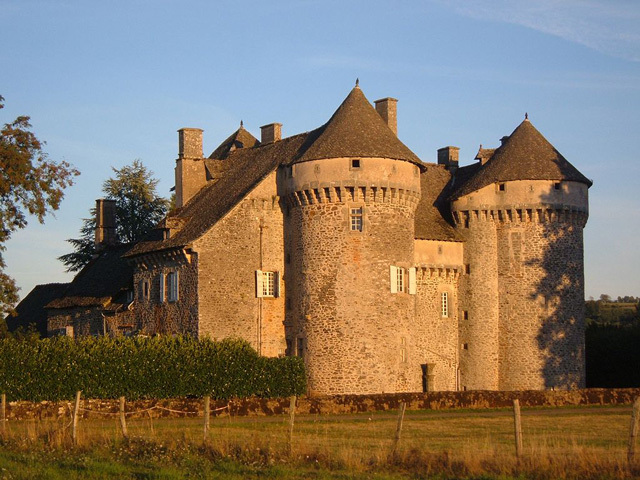 Notes: Château de La Vigne is a medieval castle located in the Cantal Ally. Square tower built in the thirteenth century, to which is added a first rectangular main building flanked by four corner towers, three round and one square. It is surmounted by a walkway with battlements. In the sixteenth century, another main building is added to the west and with a moat around it. Mural paintings of the sixteenth century are found in the Hall of Justice and in the chapel. The flanking Northwest tower is destroyed in the eighteenth century, to be replaced in the nineteenth century by a watchtower. A gate is formed in the north-east tower of arms of the current owners. The castle was registered historic building September 30, 1991 as well as the interiors of the chapel, the large living room, the dining room, the Studiolo, said chamber of Jean-Jacques Rousseau and the Troubadour room. The site is registered since 1948. The castle is open to the public since the 1970s Every year since, from 15 June to 15 September (off-season on request) In the framework of the visit, you can admire two personal collections of the owners; over 4,000 miniature cars and 1,100 dolls from around the world.